Riverfront can be an aesthetic asset, but may also run risks of hazards such as flooding and ice damage. 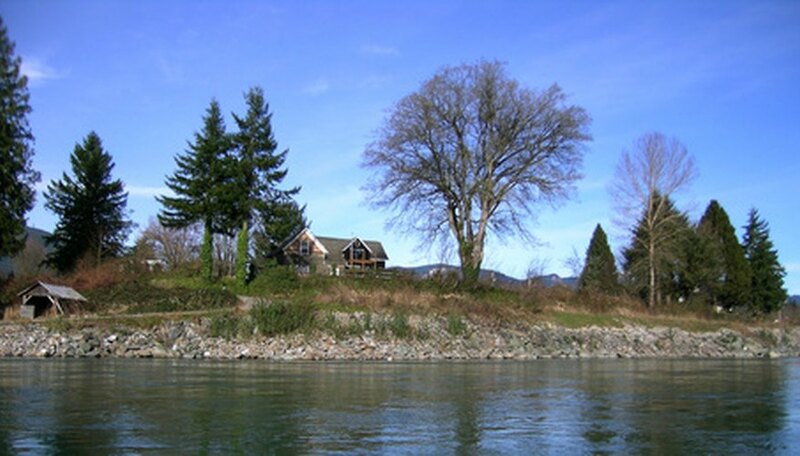 Landscaping a riverfront property should take into account both visual and physical access to the river, the potential for erosion, protection of ecologically significant riverine habitat, as well as the viewshed from the river looking back at the property. A formal lawn, framed by an allee of shrubs, willows, poplars or evergreens with a strong vertical habit, creates a riverfront landscape consistent with historic estates, such as Drayton Hall in Charlestown, S.C. The lawns at Drayton Hall have been restored to the landscape design utilized in the 19th century, where neat lines of trees and rectilinear walkways draw the eye to the vista of the Ashley River, and once at the river, create an elegantly green-framed portrait of the house. A formal lawn landscape design on a riverfront property brings the architectural structure of the home or business down to the river, which then serves as a focal accent as well as a physical and visual boundary to the landscape scheme. Landscape designers as well as urban planners are increasingly recognizing the ecological significance of riverfront property. The American Planning Association and the organization American Rivers, in their joint publication "Ecological Riverfront Design," recommend removing structures from river flood areas for economic and ecological reasons, and landscaping the riverfront in a more natural, undeveloped style. Riverbank trees suitable to the local climate and soil conditions will help stave off erosion as well as provide shade for fish and other creatures. Shrubs and wildflower plantings drawn from native riverine species are well adapted to riverfront growing conditions, so are more likely to thrive than ornamental exotics. Natural riverfront plantings provide privacy to the riverfront property while creating and maintaining riverine habitat. In the days of riverboat travel, the river was the front yard of many homes and commercial buildings. Today, urban design standards in many locations, such as those for Silverthorne, Colo., encourage architecture and landscape design which orients facing the riverfront. These standards are adaptable to private residences as well: Start with a river landing--a dock, deck or gazebo--then look back toward the house and visualize a line from the river landing feature to the main entrance of the house on the river side. Draw the eye toward that entrance with "front door" plantings of accent shrubs and bright perennials; plan a sweeping path from there to the river land feature which encourages visual movement from the river up to the house.